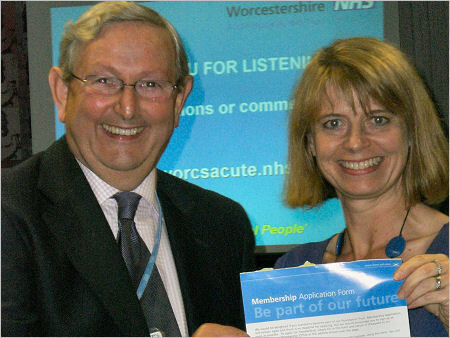 Urges residents of Worcestershire to sign up as members of the new Trust. Harriett Baldwin, Conservative Parliamentary Candidate for West Worcestershire last night attended a Public Consultation in Malvern about the Worcestershire Acute Hospitals NHS Trust's plans to become a Foundation. After asking a wide range of questions at the consultation, Harriett handed in her written responses and signed up as a member of the new Trust. Membership is open to everyone over the age of 16 who lives in Worcestershire as well as to all the staff of the Trust. Harriett Baldwin said: "I think that becoming a Foundation Trust is a step in the right direction for our acute hospitals. It gives the acute hospitals more autonomy and it involves local people more directly as governors and members. I raised the point that Malvern Hills residents need more representation compared to Wychavon residents. I also have concerns that Monitor - the new quango established to oversee Foundation Trusts - will probably still focus too much on targets and not enough on outcomes."